a drip tape winder that can rewind up to 500’ of drip tape onto a plastic core. The winder should be easily mounted on a harvest cart or loader. Install brushes on the winder to clean the tape as it is wound. 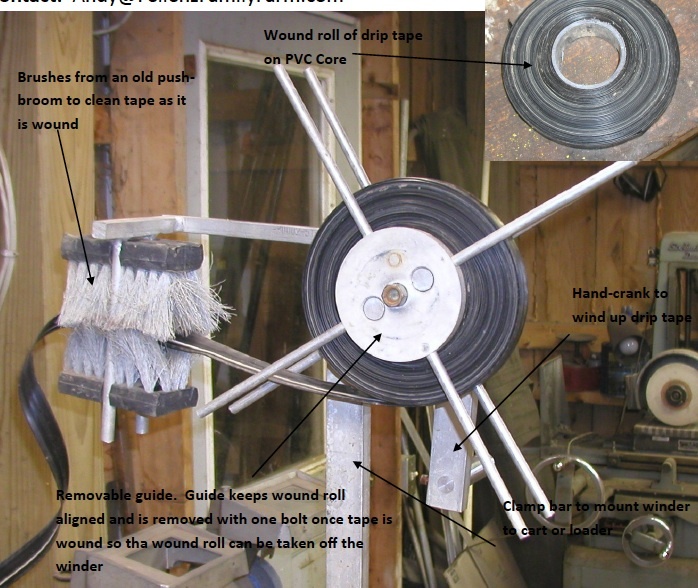 Solution: Construct a drip tape winder that can rewind up to 500’ of drip tape onto a plastic core. The winder should be easily mounted on a harvest cart or loader. Install brushes on the winder to clean the tape as it is wound. Impact: Drip tape can be easily and quickly cleaned and wound for storage at the end of the season.